To access the data, start with the NGA Arctic Support story map here and spend time on the ‘Arctic Digital Elevation Model (ArcticDEM) tab. The embedded apps provide interactive access to the elevation. The data is described in an article here from Medium.com and an article from National Geographic here. 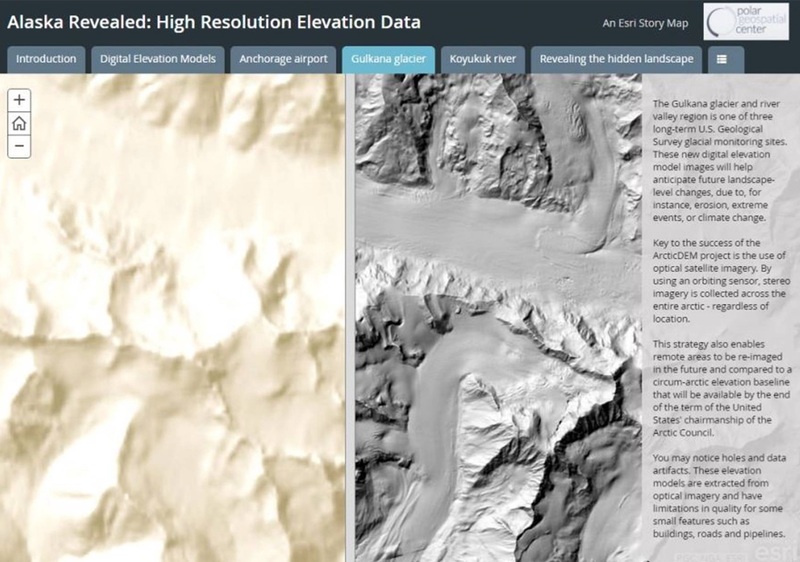 This story map illustrates the visualizations that can be generated with the click of the mouse for any user selected area, and a swipe story map explains the background on Digital Elevation Models and compares the new elevation data to the older elevation data by providing the ability to swipe between the maps. The DEMs have been computed from high resolution stereo Digital Globe satellite imagery. The DEM Explorer is a web app that allows the data user to zoom to any area and review different visualizations such as hillshade, slope, aspect, contours. As the data is temporal in many areas, users can see how the data is changing over time and summarize elevation change for a selected area. The Change Viewer is a simpler app that allows a user to click a point and graphically view the historical elevation of that location. Access to these services is also available in a wide range of applications through the Arctic DEM Group in ArcGIS Online. Most of the apps use the polar projections to reduce distortions which would become severe in generic mapping applications. Finally, a video tour of the story map highlights many of the above products and services. Quite a bit of publicity and press surrounds these data sets, but all of it is good news. Don’t let the flood of information prevent you from taking the time to investigate these resources and spend some time exploring the Arctic. The actual data is accessible through the web services, and will be of great benefit for anyone doing research in the Arctic, as the map below should make very clear. Alaska DEMs showing the heretofore available data (left) and the new data (right).